It was our gun opener on Monday and after I had a successful morning (more about that later) Luke and I got out for an afternoon hunt. He was out in the morning and had two deer walk towards him but not close enough for a shot. We were set up a couple hundred yards apart and a little after 4:00 he texted me a picture of a deer out in the field. It was too far away for a shot and heading in the wrong direction. About twenty minutes later I hear his gun fire and I grabbed my phone waiting for the text, after what seemed like forever I got his text and he says the deer walked towards him and he shot it and he was coming to get me. I grabbed my stuff and started walking towards him and as soon as I could seem him the look on his face said it all. I knew the deer must have dropped in sight. Turns out he dropped it where it stood with a perfect double lung shot from his 20ga slug gun at 57 yards away. 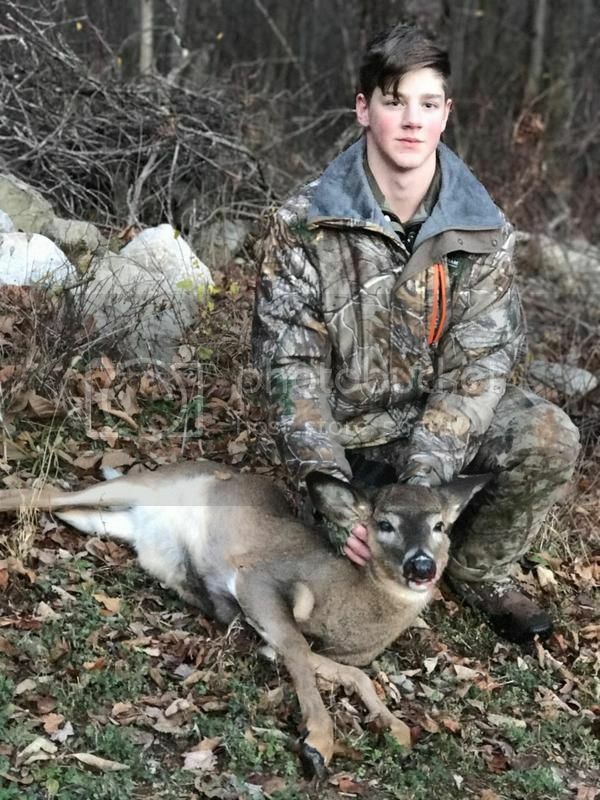 This was his first deer while set up by himself. He's shot three others but we were together at the time. Our morning started with a fresh inch of snow and seeing some deer tracks on the way to the stands. It was not only opener for shotgun deer but bear as well. I have been trying for a bear for a few years and haven't been successful. I hadn't seen anything until a bear came running in, he knew something wasn't quite right and started the slo-mo walk away facing directly away from me. He finally turned to go down the hill and I fired the shot. 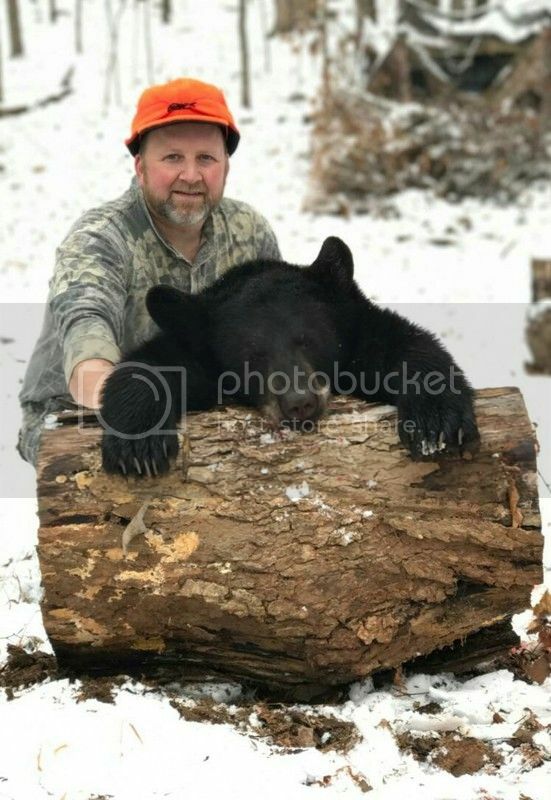 He went 20 yards and there my first bear lay. Great day for sure. Congrats on the successful harvests! Congrats on a great hunt for both of you. Well isn't that a successful hunt. Congrats to Luke with the deer and Johnny with bear. A great family outing and hunt.